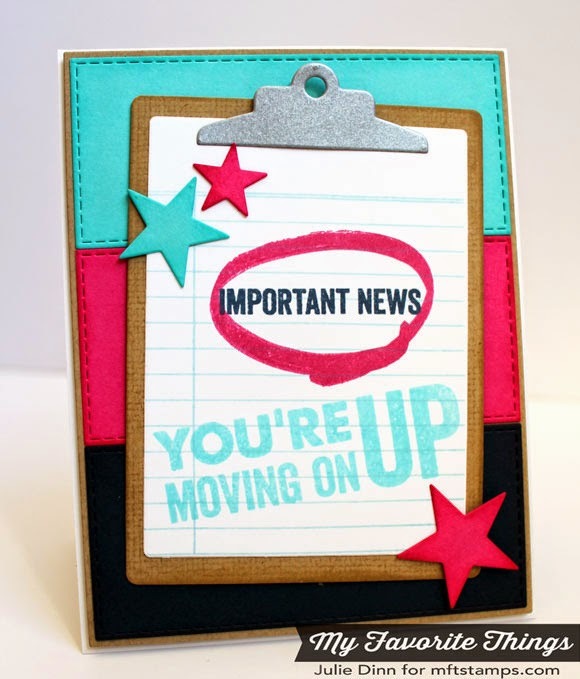 Kreative Jewels: You're Moving Up! Instead of showing you my WSC card, I have a fun office themed card to share. I finally inked up Laina Lamb's At the Office stamp set. This set is full of all sorts of fun sentiments and fabulous marker strokes. I stamped the lined paper with the Journal It - For the Record stamp set and then I stamped the sentiments. The clip board was created with the Office Supplies Die-namics. The same set of dies can also create a manila envelope. I stamped the back of the clipboard with the Linen Background to give it a bit of texture. I added a couple of stars to finish it off. Sweetheart, this is super cute, I need to ink up this set soon!